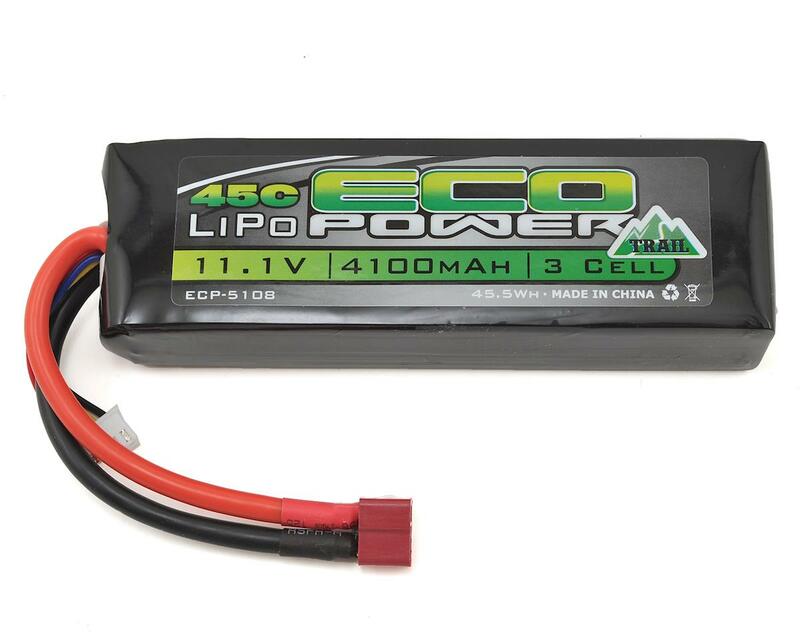 The EcoPower "Trail" 3S 4100mAh LiPo battery combines 45C discharge rates and 43x141.5x26.5mm dimensions to create a powerful battery that is perfect for high power crawler applications. This pack is a great choice for 1.9 and 2.2 class trucks running brushed ESC/Motor combos, as well as brushless rigs and heavy scale applications. This pack has a T-Style Ultra connector pre-installed, and comes with a 4-pin Align/E-Flite style balance connector. EcoPower batteries are tested in house, allowing us to provide batteries that deliver accurate specifications and reliable power, at a price that is geared towards our value conscious customers. Plus, if we say it’s in stock, you know we have it. And when you buy it, we will back it up with the outstanding customer service and support that you have come to expect from AMain Sports & Hobbies. So stop beating yourself with cheap batteries, and buy from a trusted source that proves itself time after time with quality products at affordable prices! Great battery! I've taken this battery through all elements and it has held up just fine. Will be buying more from eco power!